This comment from GreyQueen adds a lot to the conversation, especially to make a point about the ultimate cost of freebies. I liked Romney’s simple solution to the buy on get one free offer in this comment. Jez has realised through experience that the easiest way to stay organised is to reduce. Read her comment here. This comment from Mary is short and sweet but it sure outline one of the great benefits of decluttering. In this link from ecosalson.com learn five steps to better recycling. I stumbled across this site while looking for something else and it is definitely worth a read. Sue Rasmussen~ Making room for what really matters ~ How clutter control affects you. I was looking for clutter quotes when I stubbled across this collection and decided to share it with you rather than dole it out in small doses. More than one of my readers has mentioned Karen Kingston as a decluttering guru so I looked her up and found this little tidbit to share with you all. Declutter something that you just have too many off. Now that these towels are gone all that is left are towels that get used on regular rotation plus two beach towels should the need arise. I can honestly say I don’t think my linen closet has ever been this decluttered in all my married life. the stuff jez said about paper clutter is just so obvious. it sometimes takes time to understand it though. and then you slap your hand on your forehead, shout “never again” and get into decluttering gear. love it. Hi Lena, some of those quotes were amusing. And you are right about what Jez said, it is obvious, but how often do we miss what is staring us in the face. That is why it is healthy to often question how we go about doing things because even though we think we may be efficient sometimes there is a better, faster, easier, smarter way. Just like a couple of months ago when one of my 365ers ~ I think it may have been you ~ suggested I should paper the tops of my kitchen cupboards to save the arduous job of cleaning them. I can’t imagine why I didn’t think to do that. you are absolutely right. there is usually a smarter way to do things, and you just have to get the idea of those. It was me. my mum made me paper them every year again, because I am taller than her. The comments are good and the links were too. I am proud of myself. I used to see links like this and would think “Oh, I can get some good stuff here” so would bookmark them or subscribe to the feed. I’m not doing that any more. Why! I am decluttering more than my home, I’m also decluttering my life. I do not have time in my day to follow up on all of the things that I think would be fun to follow. I don’t have time in my life to take on more crafts or more of anything. So I am making myself be selective. Yes, these sites are quite interesting and have many good things to say but I’m perfectly happy with your blog, Colleen, and the community we have knit together here. 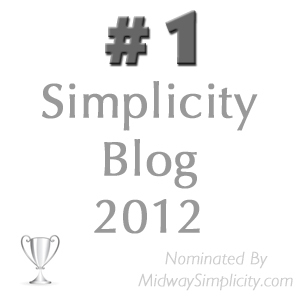 I don’t NEED another blog or web site to be able to do what we are doing here. It’s really freeing. Just to report on this week, I have now decluttered my studio/office. You should see the pile of scrapbook supplies that I have ready to sell to the ladies tomorrow. What they don’t buy will go to a women’s shelter our church supports. It will be out of here by Sunday. I have also taken another trip through the big bookcase. This time we are sorting through the albums and other “Collections.” Yesterday we tossed out 4 pounds of pictures. We kept a baby picture and the most recent picture of our non-immediate family members, a wedding picture of each couple, and the latest picture of each family. We felt we didn’t need 8 baby pictures of each or one from each year of life, or 20 of the same picnic. Some people might gasp but we have no one to pass them on to. These people are in our lives and we don’t need old pictures to remind us of them. Also, they all have their own family albums they are keeping with their family history. We don’t need to record it for them too. Another Mom is going through right now is all the letters and cards she has received from either my brother or me. If she wants to keep them all that is fine. I just want to know that she has made a concious decision about it. I am like you Deb J, about the only time I look at other blogs at all is when I check out one of my readers blogs or search for links for Fridays. I really just don’t have time because my blog keeps me on the computer long enough in one day. The shared idea that come through 365’s comments section give me enough food for thought without searching elsewhere. Well done you with the studio/office declutter, especially with the elimination of scrapbook supplies and photos. As you know I have avoided photos mostly up until now but my enthusiasm is starting to grew to get on with that job. I hope that means I am running out of other stuff to declutter. I think I almost have my crafting supplies down to an amount I am happy with although I am still considering a couple more items for declutter next week. I would like it all to comfortably fit into the cubes that I bought to store it all years ago. Well done again Deb and keep at it. Today Mom and I have been decluttering more photos, slides, and her 20 drawers of “craft/sewing” junk. We have been having a good time. I’m really proud of her. Added to that I have now decluttered 14 small albums by putting the contents into 12X12 page layouts or getting rid of the pictures totally. It’s exciting. And I am excited for you Deb J. You are your mom are doing so well, I think you have her truly converted now. I am so pleased for you. Deb J – I can’t believe the progress you have made with your mother over the months. Well done both of you! I loved the site of Sue Rasmussen. Thank you for the link. My selling at the flea market shop is going fine by the way. I made more than 20€ plus by now (still almost 2 weeks to go) and got rid of quite a lot. However, I’m filling these shelves almost faster than people buy. Today I went through my knitting needles again (I think I mentioned our supply we got gifted from all aunties and grannies in our reach), and will bring 15 pairs of needles to the shop tomorrow. Well done with your selling Sanna. It feels good doesn’t it? I sold a set of storage drawers through a Facebook social group I am involved in last week and that liberated a big chunk of space in my house and made me a neat $30. I might advertise a couple of other things there and see how I go. I also sold some ski gear on ebay, another large space liberated. It gives me a thrill thinking about how much space those few things took up and the fact that they are now gone. They will appear as my daily declutter items soon. I like to stay a little in advance on my decluttering just in case. I’ve finally got our towels down to an amount I’m happy with, too, even if that means I have to do laundry more often now. It might be a tight squeeze when guests come, though (in-laws are coming next month..eek). I am curious Faith. How often do you wash your towels? I only wash ours once a week because they dry well enough and seem to stay fresh for that period. I dare say some people would think that was too long a period but then some people wash their towels everyday which I think is a little excessive and would just wear them out quickly. If you get quests and you run out just borrow some from a friend, family member or the neighbours. We have 2 hand towels (one of which doubles as a day guest hand towel) each and 2 bathtowels. That’s the total number of bathroom towels in the house and I love it. I wash ours once a week. One set are over 16 years old and still look fine. On the very rare occasion (2 years and counting)we have a guest staying over,they can have the set we aren’t using that week. I often talk about our towel count socially and it tends to a) make other women gasp, and b) send 25% home to have a good clear out of their linen cupboard. Thanks Snosie and Katharine for your input on this subject. I thought maybe everyone might think “Gross! You only wash your towels once a week?” I figured I would through it out there anyway just to see what response I got. As it turns out I am normal after all. I would however be reluctant to put my towels in with my clothes because the towels can tend to have a lot of lint in them that sticks to other fabric making them look shabby. We wash towels twice a week but we are thinking about going to once a week. I don’t even use a bath towel. I have a toweling bath robe I put on when I get out of the shower. All I have to do is dry my feet with it and the rest dries by the time I get that done. Hi Colleen – where is Dizzy when we need someone to say something loud and proud!?! At the moment we are washing towels every 2-3 days. BUT we are in Winter here now and the day time temperature has dropped and things just aren’t drying. In Summer I try to stretch it out to 4-5 days. I wash towels once a week. I reckon you are pretty clean just out of the bath or shower. They hang over the heated towel rail (only on a few hours a day) and are completely dry, I think this is the answer. My colleagues (or some) would have screamed yuck! I wash towels with the sheets, and limited white things (undies, a shirt or two) (as I’ve mentioned before, I always use white towels, and they are ‘scitchy’ so limited lint). Once a week for me too- and likewise not with clothes because of the lint issue but I might wash them with sheets. and I am the exception – I dont even wash weekly. I change the towels when I feel they need a wash (and that can be a long time actually). I also take them into the washing if it happens to be the right load. BUT! I do have 2 Sets of towels in use. one at home and one in my sportsbag. three times sports a week, its no wonder my towels at home arent smelly after some time. I start to think that I dont need more. and as its summer, my washing dries within a day, so I could actually go down to 2 sets instead of four. Need to think about that. 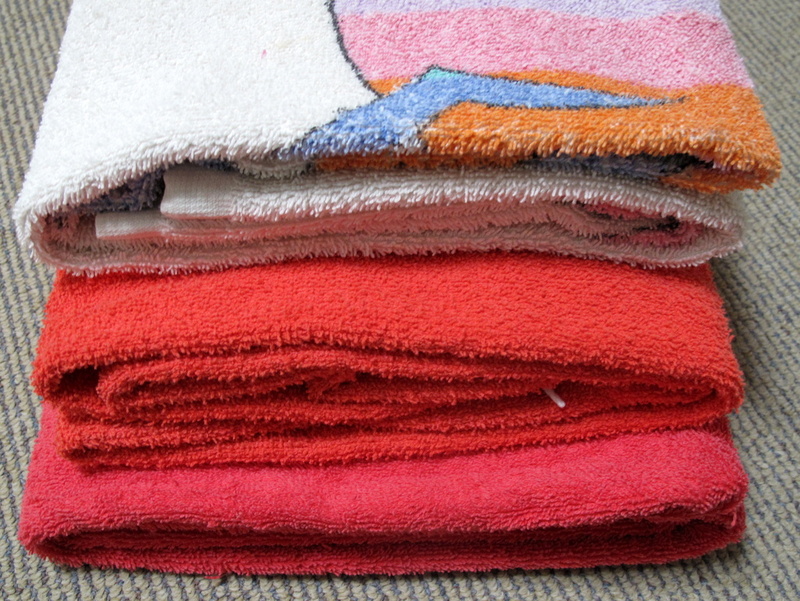 I wash them about every week, too and we also have a quite minimalish set – though there are still a few towels that are almost never used and will probably be decluttered soon. I always wash the towels hot though, together with cleaning rags, kitchen towels and/or sheets. I wash them at least at 70°C, whereas I wash clothes at about 30°C. wow, a lot of people are interested in towel laundry..heh. i really hate doing laundry, so i used to like having enough of whatever on hand so that I would only have to do it once every other week. Now we have about 6 reg towels and 2 hand towels, so it’s more like once or twice a week. we have a small bathroom and so they don’t dry well. husband tried to alleviate this by placing the towels in more ventilated areas to dry, but it annoyed me as I think it looks “ghetto”. heh. I am at a loss to know where to buy better quality clothes that will last (in Australia)…I seem to be always replacing clothes that have worn out and every shop seems to sell cheaply made Chinese imports, regardless of whether it is a low end or seemingly higher end chain store or even a better Department store like Myer. Second hand doesn’t work for me as sizing is never right! Any recommendations as to brands or shops with quality that will last…summer clothes are worst as they get washed so frequently in our hot climate, and I won’t dry clean due to cost and chemicals. Thanks! Holly, I feel like Review is a great brand (pretty sure it’s australian designed if not made) though a lot of their stuff may say to be dry cleaned, I just wash in a ‘delicate’ cycle. Today I’m wearing a fantastic Veronika Maine cardigan – was very pricey, but I’m happy with how it’s lasted two years. I’ve always thought Country Road is good quality, but to be honest, it’s not usually to my style. I have a good (thin) Marcs jumper in 100% wool that I’ve also been very happy with how it’s worn over the years. I also believe Cue is very well made, very corporate, but I’ve not tried it as it’s not to my taste. Summer stuff is the hardest – it’s usually thinner/lighter fabrics, which I feel aren’t as durable. I do recommend LuluLemon, which is predominantly sportwear (like workout wear, not that weird ‘sportwear’ that equals something totally different in the US! ), very very pricey, but the two pairs of leggings I have look close to new despite one pair being almost 3 years old (and they are uber thick, warm, great for me in winter!). Not Australian made, but… worth it in my opinion. Hi Holly, I wrote a great big long response to this comment and it disappeared into thin air. I got distracted by a phone call and must have escaped out of the page before publishing it. How annoying.Anyway I think I will turn those thoughts into a post on the subject for next week. I will get some tips from my mother as well since she has a lot of experience in this area. As for where to buy reasonable quality clothes in Australia ~ that can be hit and miss. I don’t tend to shop brands except when it comes to shoes. For everyday clothes I would avoid K-Mart but Target often have some quite descent stuff. Susan Grae and Katies usually aren’t too bad either. Also Glassons is good for t-shirts, tank tops and skivvies. Don’t be fooled by price it doesn’t always guarantee quality so don’t assume the higher end stores only carry good wearing better quality clothes. Aldi has Crane brand winter wear, like skivvies. And for those inevitable school snow trips reasonably priced snow gear. The bath towels are under control, so much so, I feel like leaving the cupboard door open for all to see! Any suggestions for kitchen towels ? Rarely used to wipe up plates they end up as multitask towels, used once and left on bench awaiting a trip to laundry. Anyone have a solution? Cheers . I hang my tea towel over the rail on my oven so it dries if it’s damp, and always available. I use a fresh tea towel, kitchen cloth and scrubby (Silver Lady) every day. I sling the used ones in the washing machine and they get washed with whatever goes in next. Hi Janetta – I like the idea about the heated towel rack but my hubby read that they are big electricity users and promptly turned them off in both bathrooms and its remained so ever since. Maybe I could do some sort of maths of how much washing towels for 5 people 2-3 times a week adds up to…..
hey Moni, do that. because honestly I dont see the point in washing so often. with all this drying and folding and work behind it, it might be smart to hang towels somewhere smart to dry. and if its the heated towel rack. I have one of those too as the only heater in the bathroom. its summer here and I would be mad to turn it on. but my towel still dry on it. We have put on timers so they are only on for four hours a day, (two hours morning and evening) this makes them very affordable. Hi Monica and welcome to 365 Less Things. By all means link to where you purchase them, I am all for finding out where one can find reusable products in place of disposable ones. I must say though that I worry little about cross contamination, I rarely if ever get tummy bugs so I guess I have built up a good immune system by exposing myself over time. Not that I am a dirty person but immunity is an acquired thing and it won’t occur without exposure. lol…I have small kiddos…so cross contamination was a polite way to say boogers and drool that I don’t want on me. 😉 Also…dirt and stuff that comes in on their picked “flowers” and treasures. roflol Here is where I get mine. I have a small basket that holds about 6 dozen of them….they are wonderful little towels! Well here I am, in the middle of a busted mains water pipe, up to my armpits in washing and scrap supplies that have been dragged out and put back so many times due to house buyers tramping through, I have given up on my sanity and I’m off on a shopping trip to buy stupid things to clutter up my house and life!! Towels hahaha I don’t know where to begin, I have 12 in constant rotation, (used to have 36!!!) with us being sporty and with dance it calls for quick numerous showers, yeah I know I’ll be tied to a stake and burnt as a heretic but I use the eco select on my machine and that lets me re-use the water for a few washes, it takes a bit of juggling come wash day but I manage to avoid all the ‘soggies’ which would happen in Winter. Summer is great cos they can hang on the line. Right now I probably average washing towels 3-4 times a week, after swimming they have to be washed, I aint living with the chlorine smell yuck!!!! Moni we used to have a heated towel rack and it was very economical to run. I know they probably would be used more in climates that have long wet winters but it was great when we had it, our electrician friend reckons those heat your bathroom lights are more expensive to run and you are turning them off and on which uses more. Another tip to consider is maybe airing off your ‘dampies’ in front of your heater or fire rather than the dryer. Might look a bit fugly overnight but it’s only you and your family seeing it and they are all dry again when you need them. Well you have made me laugh Dizzy with your golf ball story – that is so bad but so funny! Sounds like that golf ball was pretty determined to make it to your table by hook or by crook and noth’n was going to stop it ! Good luck with the house buyers and the burst water pipe! and thanks for sharing with us in the middle of your mess! Your comments are always entertaining Dizzy, I’ll say that for you. And today you were particularly and humorously heavy on the Aussie slang. It amused me to think of some of our overseas readers trying to decipher what you were saying. I am sure they will be amused by “fugly” once they work out the conjugation involved there. I agree Target aren’t bad with the quality of their clothes and are at a reasonable price as well. I also agree that footwear is worth spending extra $$$ on and I sure as heck wouldn’t pay $200 or even $50 on a pair of shoes that weren’t made of leather. my towels weren’t particularly odd just too plentiful and some had to be culled. You are right it was very freeing. It isn’t just the freedom from the clutter it is the having no desire to replace anything with something new. ‘Foregoing Clutter for Clarity.. and Trash for Time!’ Well said Vicki S.
I’ll forego clutter for clarity any day. There is a whole lot of clarity going on in my house. My favourite quote for the week would have to be Colleen’s “financially sound pre-emptive strike”. Just love it!- which I may have already said but I’m saying it again. Here in the uk, it is generally harder to dry washed clothes/towelsthings in the summer, because of (too many) damp days, and easier in the winter with the central heating on. If we ever consider getting a tumble drier again (and no plans to) it would be for the summer. The towel laundry thing is curious. Bath towels I do mostly once a week – unless they’ve been used on the dog, greasy hands or poison ivy. Kitchen towels are replaced daily. Does anyone remember growing up before electric dryers etc? maybe even with wringer washers? Some must live in dry climates where water is precious. My mom was a much better housekeeper than me, and laundry basically got done once a week for linens. At college, in my 1st year I had laundry service for linens – once a week. That school also used cloth napkins – it sounds like a luxury until you realize that new one were provided on Sundays and Wednesdays. And a friend whose mother was an ace homemaker told me in her home, bed linens were done this way: bottoms were laundered once a week, the tops ( not fitted) were put on the bottom and clean sheets on the top. This is one area where work has increased because it became “easier.” even though it still takes time and water. The discussion is making me think through the number of sheets I have – too many! Hi Cheryl and welcome to 365 Less Things. You are sending me down Memory Lane with this comment, yes I remember growing up without a dryer, my mother still doesn’t own one, never has. And yes, I also not only remember wringer washers, I used one. My crazy mother still uses a twin tub, I think we could have her committed for that. 😆 You are so right, modern day washing machines makes it so easy to waste water and electricity without batting an eyelid. I’ll stick to the old school way, it hasn’t killed me yet. I am glad you are also a once a week towel lady, good for you.